Enhance your home décor by installing beautiful hardwood flooring. Solid or engineered hardwood dramatically boosts the appeal and value of any home or business. For a fine selection of solid hardwood, come to our spacious flooring showroom. We offer the best selections and services in town. Our knowledgeable flooring professionals will help you find the right wood floors for your home. We make it easy to make your selection from the many options of species, grains, colors, and finishes. We do this by asking questions about your lifestyle, decorating preferences, and flooring budget. Some of the quality brands we carry include: Downs, Floorcraft, and Spotlight Values. 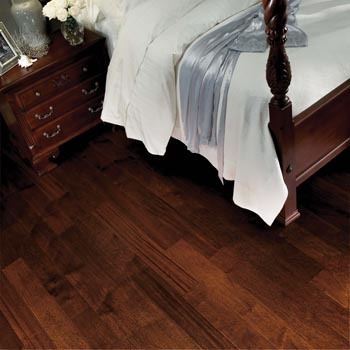 Hardwood is so easy to clean and maintain, yet strong enough to endure heavy foot traffic. You can find the type of hardwood you like at an affordable price plus receive comprehensive hardwood flooring installation from our professional team. Manufacturing has done much to improve wood flooring – both in quality and affordability. So this is a great time to buy. Engineered hardwoodis a flooring product that has been enhanced during the manufacturing process. This exceptionally strong wood does not react to moisture. Instead, it remains flat and straight, thus preventing damage due to changes in humidity. Engineered hardwood is made from multiple layers of wood that are bonded together. The top layer is a veneer of the wood species that you select. The other layers are composed of plywood or high-density fiberboard. Solid hardwood flooring comes from the hardwood species of your choice, such as cherry, oak, maple, or walnut. Each individual plank is milled from a single piece of lumber. You’ll find this flooring to be strong and durable. In fact, it can be refinished as much as 10 times. Your solid wood floors can last up to 100 years. Solid wood costs a little more than other styles of wood flooring, but its value and beauty are unmatched. Solid hardwood brings the classical warmth and elegance of wood floors to your home. Many of our customers prefer the distinctive texture of hand-scraped hardwood floors. The look dates back to the time when woodworkers would use a knife to smooth wood planks. This created a scraped effect that today is done by hand or by machine. Hand-scraping adds character and visual appeal to wood flooring. Hand-scraped hardwood floors are a great investment in your home as they are beautiful and long-lasting. In fact, this flooring lasts for decades. Your gorgeous hardwood flooring deserves professional installation. The installation technicians at our flooring store know how to install hardwood so that is lays flat and resists damage. We begin by preparing the subfloor so that everything is clean, dry, and level. We then install solid wood over a wood subfloor, using nails, glue, or staples. For engineered wood, the options include nails and glue. We can also install a “floating” floor that allows room for expansion due to humidity. This involves attaching the planks to each other, rather than the subfloor. With flooring that lasts as long as wood does, it is crucial to get the installation right. At our flooring store, we are so confident of a successful installation that we provide customers with a lifetime guarantee. Let us know about any installation issues and we will fix them at no cost to you. Contact us today for expert assistance and professional installation for your new hardwood floors. We proudly serve the communities of Beaumont, Orange, Port Arthur, Nederland, and Port Neches, Texas, and the surrounding areas.